BOTOX is as popular in London, Ontario, as it is throughout Canada and the United States. 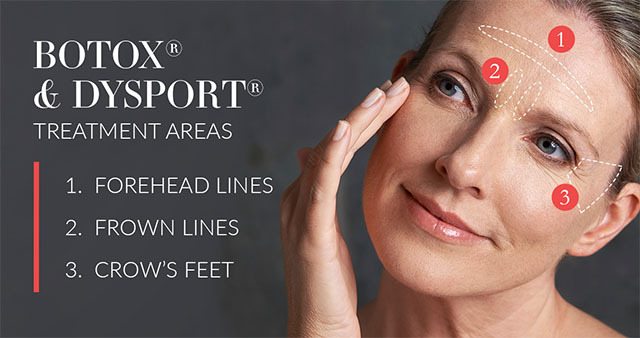 Women and men come to DermEffects for this renowned treatment to smooth forehead wrinkles and soften lines around the eyes, such as crow’s feet and frown lines. Injections of this neuromodulator can create a rested, refreshed appearance without causing an unnatural appearance. We also offer XEOMIN®, a similar neuromodulator that can be the best choice for some patients. Dr. Wei Jing Loo is a Royal College-certified dermatologist who performs cosmetic injectable procedures with the precision of a physician and the eye of an artist. We are offering a special discount on BOTOX® Cosmetic at our 2019 Open House! Learn more about the 2019 Open House. The active ingredient in both BOTOX and XEOMIN is a naturally occurring protein that, when injected in very small amounts, temporarily relaxes the targeted muscles. Wrinkles and lines that form when those muscles contract appear smooth after the injection of BOTOX or XEOMIN. Photos courtesy of Allergan. Keep in mind that each patient is unique and your results may vary. Why Choose DermEffects for BOTOX? It’s important to choose an experienced, qualified injector for BOTOX or XEOMIN treatments. Dr. Wei Jing Loo is a Royal College-certified dermatologist who performs cosmetic injectable procedures with the precision of a physician and the eye of an artist. Expertise: Dr. Loo is one of the leading providers of BOTOX treatments in the area. She specializes in cosmetic dermatology and understands the facial anatomy affected by aesthetic injectables. Results: By taking a conservative approach to BOTOX injections, our patients look like themselves after a treatment, but naturally refreshed. Options: BOTOX and XEOMIN are certainly among the most popular treatments at DermEffects, but we offer a range of nonsurgical aesthetic procedures for the face, including dermal fillers, laser skin resurfacing, and microneedling. BOTOX treatments typically take less than 15 minutes at our office and require no downtime or recovery. You can return to work, run errands, or resume other daily activities immediately after your procedure. Vertical lines between the eyebrows can create a permanent frowning expression. BOTOX relaxes the 3 specific muscles that cause these glabellar lines, sometimes called “worry lines” or “the 11s,” because they form parallel lines, looking similar to the number 11. When you look in the mirror and raise your eyebrows to make a surprised expression, you’ll notice that your forehead muscles crease horizontally across your forehead. Over time, these creases can make you appear older, but BOTOX helps to smooth the appearance of these wrinkles. Dr. Loo takes a conservative approach to treating forehead wrinkles because when used improperly, BOTOX may cause sagging eyebrows. Crinkly lines at the corners of the eyes created by years of smiling and squinting are often called “crow’s feet” and are one of the primary culprits of early signs of aging. BOTOX is used to help minimize these lines and create a smoother complexion. Some of our patients begin getting BOTOX injections in their late 20s or early 30s to curtail these lines before they become too deep. Yes. 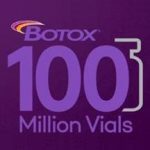 BOTOX was first approved in 2001 by Health Canada for cosmetic use. When administered by a trained, experienced professional, these treatments are very safe and have a low risk of complications for most people. Will the injections “freeze” my facial expressions? This is a common question we hear at DermEffects. BOTOX and XEOMIN soften lines and smooth wrinkles, but you will still be able to change facial expressions. The “frozen” appearances of some celebrities are typically caused by having too much BOTOX injected, having the wrong muscles injected, or are the result of surgery. Dr. Loo discusses the goals and expectations that each patient has before the treatment. The cost of BOTOX injections varies from patient to patient, depending on the number of treatment areas and how much BOTOX is needed to get the desired results. The quoted prices are generally per unit of BOTOX injected. This varies from patient to patient, but generally speaking you can expect to start noticing results about 4 to 7 days after your treatment. Most patients continue seeing improvements for another week, with the maximum results occurring about 2 weeks following the injections. Again, the duration of your results may differ from the experience of another patient. BOTOX typically produces results that last up to 4 months, although some patients may see results that last a month or 2 longer. Periodic treatments can help maintain the results in a manner that appears natural. It’s well-known that BOTOX is one of the leading procedures to treat wrinkles, but an increasing number of younger patients schedule BOTOX appointments to delay the onset of lines and wrinkles. The key word is “delay,” rather than prevent. Wrinkles inevitably develop, but because BOTOX works by limiting the movement of facial muscles, it can actually postpone dynamic wrinkling. Patients from as far away as Chatham-Kent and Sarnia travel to DermEffects for BOTOX injections. You can learn more about BOTOX and the services provided at DermEffects under the expert guidance of Dr. Loo and her team by using the online form to request a consultation or by calling our office at (519) 472-8686 to schedule an appointment.